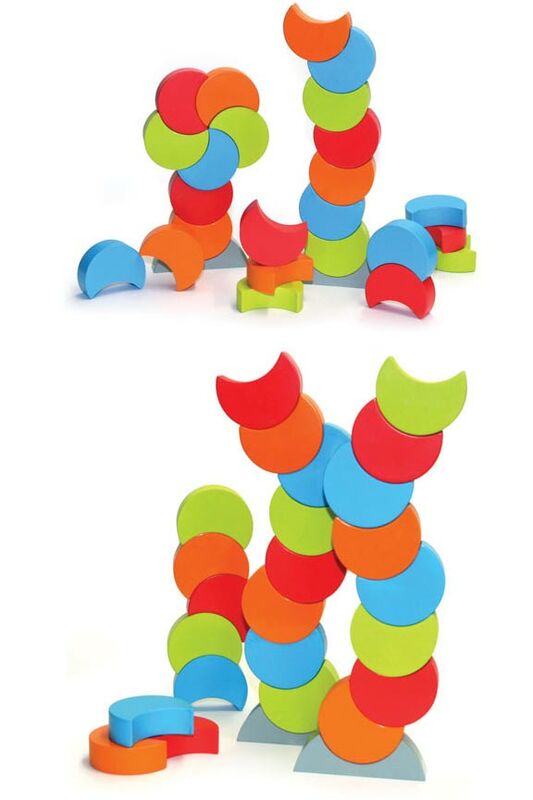 Crescent Shaped Stacking Toy That Is Internally Magnetized. This toy is no longer available. It has been replaced by a new and improved version 2.0. You can find it here: Arx 2.0. These chunky, moon-shaped building blocks feature vibrant coloring, and a substantial weight that feels gratifying to hold. Unlike ordinary cubes and cylinders that regular blocks are shaped like, these crescent ones offer a different way to build that will result in more unusual creations. They would not stack and stay together so well if it weren't for the internal magnet that rolls back and forth on the inside of the block. This added magnetic force makes them easy to build with, but also allows for designs that don't look possible. Children can fit the pieces together in any number of ways to create towers that bend and sway, but never fall over. Because they are rounded on one side, and concave on the other, it is easy to construct deigns that curve through space and seemingly defy gravity as they hang there. Each set comes complete with 24 stackable pieces, and two optional bases to use as a starting point. They are meant for children as young as three years old, but due to the versatility and advanced design, they will appeal to much older children and adults as well. 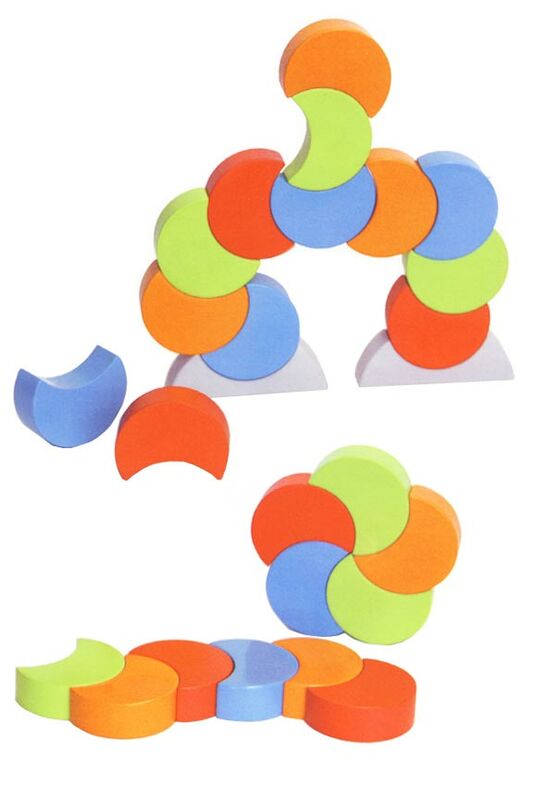 Don't settle for ordinary stacking toys when you could deliver more fun with these oddly shaped magnetic ones. Stack them tall, or arrange them flat across a table mosaic style. Because these blocks are magnetic, they stick together just by touching, and they do not have to align in a specific way, or snap together to do it. When set on the points, the crescents will sit sturdy where you place them. If flipped on the other side, the curve will cause them to rock and roll. You can build up vertically, or curve around in a circle. Rotate the pieces as the attract to each other in order to build sturdy, but awkward looking towers. You can use the included base pieces as a starting point for stability, or go without them for a more challenging build. Children will enjoy the unique way in which they are able to play with these, but they will not become frustrated because they are so simple and enjoyable. The concept is pretty simple, but the results are extravagant. Each piece is essentially just a hollow plastic block, but the shape and magnetic interior make them more than just regular blocks. Squares and rectangles are boring, and often lead to stiff and stale designs. The shape of these blocks makes those run of the mill designs impossible as it encourages children to push the boundaries and really use their imagination. On the inside of each piece, there is a strong magnet that will roll from one side to the other. In this way, it is able to perfectly position itself in order to attract and hold other pieces. Because you don't have to join them at any specific spot, the possibilities are literally endless. Because there are no complicated connectors, or tiny pegs to line up, any child can combine these shapes to build without frustration. Children love the fun colors and unique styling, and repeat play is quite common due to the ease of use, and shear versatility of design. Parents will enjoy the mind bending creations that children produce, and appreciate the way in which this toy pushes the boundaries, and helps to develop important skills. Order Yours Today! Dimensions Each piece measures .75" x 2". Bottom supports are slightly larger. Overall dimensions of final build will be dependent upon design and construction. 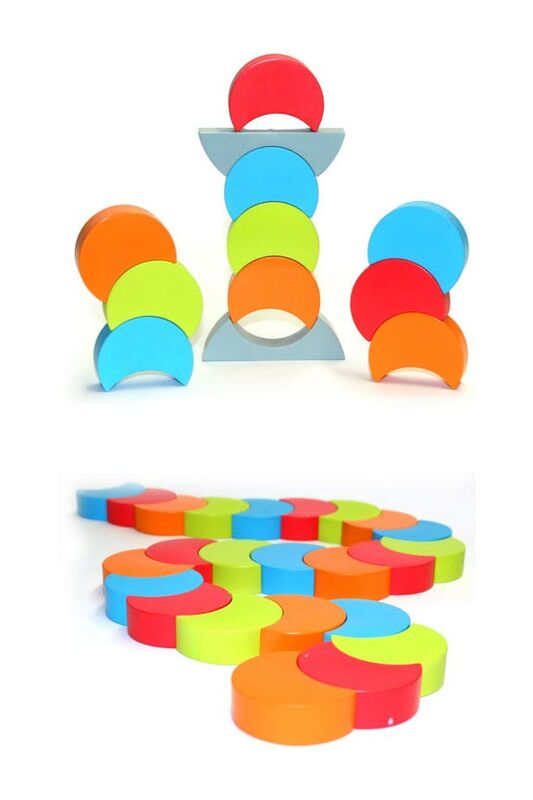 Arx Magnetic Building Blocks - Fun, crescent shaped stacking pieces with magnets inside. 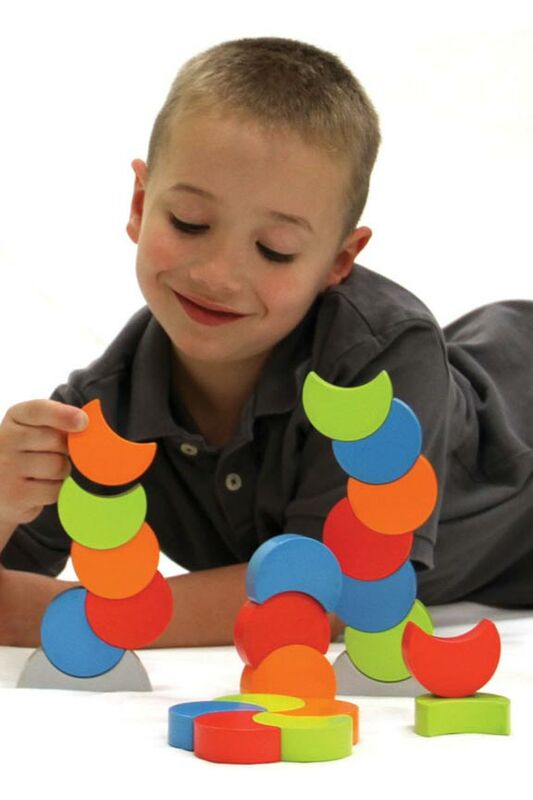 The unique shape and magnetic attraction allow kids to build precariously shaped structures that bend, sway, and appear to defy gravity. Order Yours Today! Arx 2.0 - The new and improved version of this toy.